Mixto is a reinforced hybrid natural surface, developed specially to meet the needs in sports contests. It is a combination of natural and artificial grass. 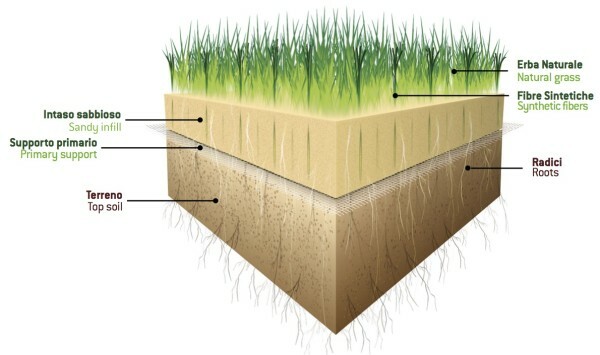 The artificial support favourites the birth, the growth and the development of the natural grass. The special support allows the roots to develop deeply and avoids the raising of grass sods while playing. Mixto grants stability, permeability and security to athletes at a maintenance cost lower than completely natural turfs. The top-soil structure does not change avoiding mud or degraded zones that could compromise the playing surface. This system also avoid a possible hardening of the soil. OF NATURAL AND ARTIFICIAL GRASS. Its special feature, based on years of experience and studies, is the primary support. The synthetic filaments are stitched on a particular support. Mixto grants a perfect oxygene supply and the top-soil permeability. The balance between water-air-soil is unchanged over time.